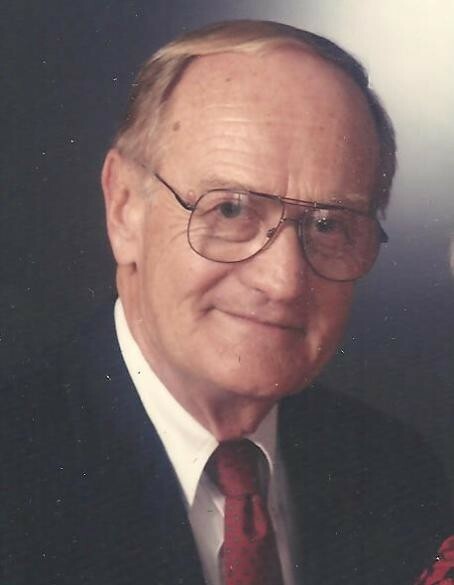 Robert E. “Bob” Schmidt, 90, Hays, passed away on Tuesday, August 8, 2017 at his home. He was born June 20, 1927 in LaCrosse, Kansas the only child of Andrew and Mary (Petrik) Schmidt. He grew up in LaCrosse where he attended school until leaving High School to join the U.S. Navy, where he served in the Philippines during World War II. He then began a career in radio while in college as a sportscaster. On December 28, 1949 he was united in marriage to Patricia Ann “Pat” Everton in LaCrosse. They enjoyed nearly 69 years of wedded life together before she preceded him in death on August 28, 2015. Continuing with his career in radio and upon graduation from Fort Hays State University in 1950, he was appointed General Manager of KAYS Radio. He was elected Vice President and Director of KAYS, Inc. (now Eagle Communications). In 1989 he purchased control of the corporation and was elected President/CEO. While leading the corporation, the company built or purchased twenty four radio and television stations and twelve cable systems in Kansas, Missouri, Nebraska, and Texas. The company now has twenty eight radio stations and sixty cable systems serving communities with broadband, video, and telephony services. Bob retired as President/CEO of Eagle Communications in 1998 and sold the majority interest in the company to its employees through an Employee Stock Ownership Plan. Nearly 300 Eagle Employee-Owners continue to build the company and share in the value of ownership. Bob has continued to maintain his office in Hays and has supervised the management of Sweetwater Ranch near Hays, and has been actively involved in numerous business projects including real estate, banking, stocks/bonds, and oil and gas development. He has been a leader in the Broadcast Industry having served as Chairman of the CBS Television Network Affiliates Association, Chairman of the National Associated Press Broadcasters Association, Chairman of the Kansas Association of Broadcasters, Chairman of the Kansas State Chamber of Commerce, and many others. Numerous honors and recognition have been afforded Bob through the years including; Ward L. Quall Leadership Award from the Broadcasters Foundation of America in 2013, Distinguished Service Award from the Kansas Association of Broadcasters in 1972, Kansas Broadcasters Hall of Fame from the Kansas Association of Broadcasters in 2000, Broadcaster of the Year from the University of Kansas in 1964, Huck Boyd Community Media Leader of the Year for Radio from the Huck Boyd National Institute for Rural Development at Kansas State University in 2013, Hall of Fame Award from Hays, Kansas in 2003, Most Valuable Citizen Award from Hays, Kansas in 1989, Alumni Achievement Award for Public Service from Fort Hays State University in 1973, and the Outstanding Young Man of the Year Award from the Hays Chamber of Commerce in 1956. Bob continues to be a major contributor to projects important to Ellis County and Kansas through the Bob and Pat Schmidt Foundation. Fort Hays State University, Hays Medical Center, numerous civic groups and industry groups have received their generous philanthropic support and will continue to do so through the foundation. Survivors include a son; Anthony Schmidt and wife Loreta of Lawrence, Kansas and their children; Andrew Schmidt and wife Paula, Lexie Baker and husband Jeff, Zachary Schmidt, and Olivia Schmidt, two daughters; Ann Onymous of Lewiston, Idaho, and Sue K. Schmidt of Deerfield, Florida. He was preceded in death by his parents and his wife Pat.